Great Sphinx at Giza, Lower Egypt. Latitude 29.975350. Longitude 31.137500. Ancient site at Giza in Lower Egypt, 12 miles south-west of Cairo. The ‘Great Sphinx’, also known as ‘the Sphinx of Hamaldis’, whilst during the time of the ‘New Kingdom’ it was called ‘Horus of the Horizon’ and, in modern Egyptian Arabic ‘the Terrifying One’ – (Wikipedia). It stands just 200 metres from the Pyramid of Khafra, and is known to the local inhabitants as ‘the guardian of the Giza necropolis’. 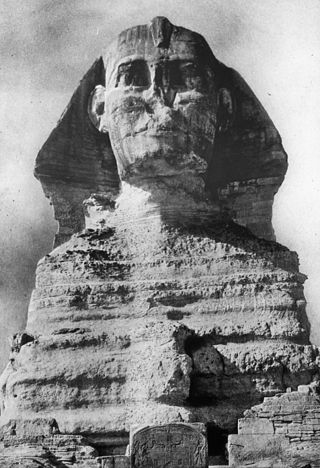 The nose of the sphinx was apparently chopped off back in the 7th century AD and, not as many historians had once thought, by the cannons of Napoleon Bonaparte’s army in 1798, but I suppose that made for a good story! 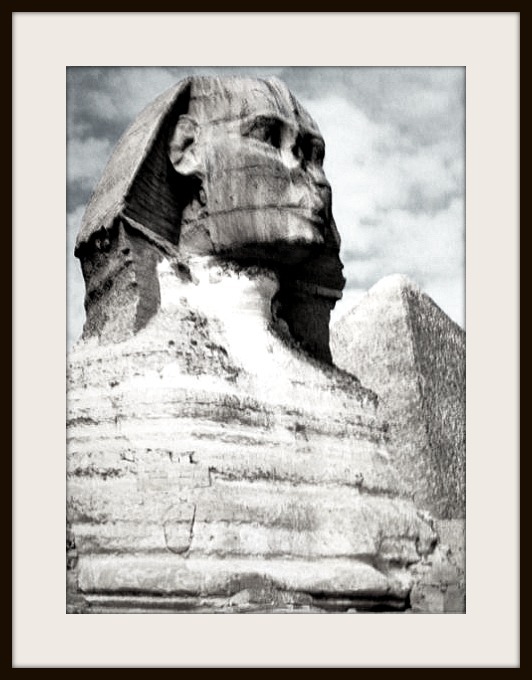 The great sphinx dates from the 4th dynasty of the pharaohs (2,575-2,467 BC) and is thought to represent Khafra, who ruled between 2,558-2,532 BC). However, some historians now think the statue might date from the New Kingdom (1,570-1,070 BC), according to author Cathal Coyle in his “very concise” article ‘Famous Landmarks’ in the magazine ‘Ireland’s Own’. This gigantic crouching limestone monument, located on the western bank of the river Nile, is 66 feet high, 63 feet wide and 220 feet in length; and has the body of a lion and the head of a human, possibly Khafra, but there is no certainty about that. Coyle goes on to say: “Representative of two Egyptian gods – the pharaoh god and the lion god, the sphinx combines the body of a crouching lion with the head of a human. In ancient times, it is thought that the face and body were painted dark red and the head cloth was yellow with blue stripes.” There are said “still” to be traces of this red paint on the head of the sphinx, especially ‘it is said’ near one of the ears. Coyle, Cathal., Famous Landmarks, Ireland’s Own, (various dates), Wexford, Ireland. Categories: Archaeological Sites, Pyramids at Giza, Temples | Tags: Great Sphinx at Giza in Egypt | Permalink.